With options ranging from Boot Camp to Parallels to VirtualBox and others, the big question is which one makes it easy to manage Windows-running Macs within your enterprise IT infrastructure. Other than a few interesting years in the mid-2000s, Apple’s approach to the enterprise market has been one of benign neglect. The one exception, starting in 2005, has been consistent support for running Windows on Macs. Apple test beds in our lab include a variety of Mac desktops and laptops (and even a few Xserve servers), but most cross-product benchmark testing for this review was done using fully upgraded 2012 Mac Pro towers as a reference platform. Though getting a little long in the tooth, they are quite fast, rock-solid and standards-compliant, and unlike more recent Macs, the hardware can be swapped, modified and expanded as needed (CPUs, RAM, storage, standard PCIe graphics and expansion cards, etc.). The primary Windows drives on the test platforms are on mSATA or M.2 SSDs run from a PCIe expansion card to maximize throughput and performance, but we also run baseline tests with virtual machines stored on standard 5,400rpm rotating drives to make sure performance is still acceptable with low-end hardware. I tested five Windows-on-Mac options in our lab — currently shipping versions of Apple’s Boot Camp, CodeWeavers CrossOver Mac, Oracle VirtualBox, VMware Fusion and Parallels Desktop. They vary in cost, complexity and feature sets, and my perceptions of their pros and cons might help you decide which will be best for your circumstances. 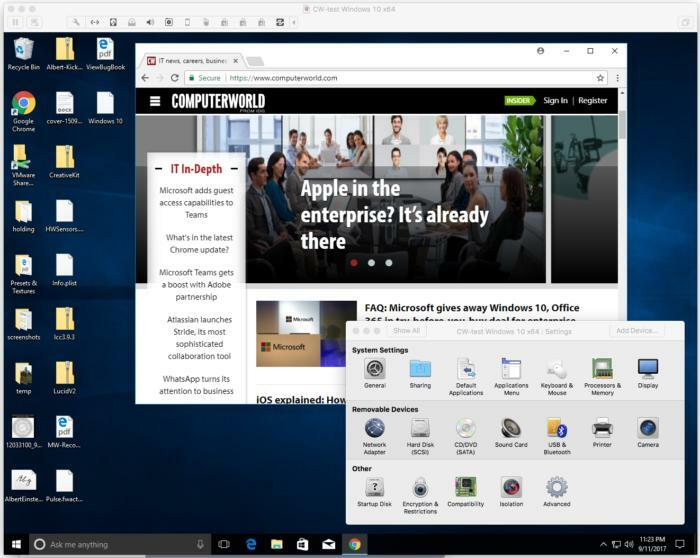 I will follow up in coming weeks with a deeper look at VMware Fusion’s upcoming version 10 and Parallels’ recently released Desktop 13. Using a basket of benchmarks covering CPU, graphics and sample workflow measurements, performance was simply not a key differentiator in these tests. All of the products we tested are mature and stable, and aside from the natural differences between Boot Camp and the rest (native hardware support vs. virtualization or emulation — discussed further below), the average performance difference between products in most circumstances was 10% or less. That is not to say there are not quantifiable performance differences, but rather that all of the products I looked at (sometimes with a little tweaking of virtual machine settings) can do what needs to be done with reasonable and effective speed — as long as what you want to do isn’t to play 4K-resolution twitch games at 60fps, that is. Virtualization always incurs processing overhead, and it will never be as fast as native, non-virtualized instances — which brings us to the first option, Boot Camp. Apple’s Boot Camp was the first supported option allowing Mac users to run Windows on Macs, and if you need to get the absolute maximum speed out of your Mac hardware while running Windows, Boot Camp is still the way to go. A Mac running Windows via Boot Camp will perform at pretty much the same speed as a dedicated Windows machine with equivalent hardware specs — in fact, Macs have often made great higher-end Windows machines, and compatibility is usually not an issue (as long as Apple supports the version of Windows you need; see below). A big drawback with Boot Camp, however, is that every switch between Windows and macOS requires a complete reboot, which gets frustrating if you have to do it a lot. There can also be compatibility issues when accessing files on NTFS-formatted Windows drives from the Mac side — though third-party drivers are available, such as those from Paragon Software Group, that bridge that gap. And the new APFS drive format used in High Sierra is going to raise similar compatibility issues, at least until Apple or a third party comes up with a fix for reading APFS drives from Windows. Even an individual machine can be difficult to set up with Boot Camp, and of course a large, heterogeneous enterprise deployment will be more so. Adding stand-alone, unmanaged copies of Windows to your environment via Boot Camp may not be advisable from a security or manageability perspective. Apple’s Boot Camp Assistant program, used to install Windows on an individual Mac, is certainly usable and does the job, but it’s not always the easiest program to work with, especially if you have a complicated hardware setup. (To be fair, this can at times have as much to do with how Microsoft’s Windows installers handle things such as multiple drives and drive formatting/partitioning options as it does with Apple’s installation process.) Expert users (and IT staff) should have no problem, but those used to fairly seamless and simple Mac installations may find it far from intuitive. And there is the fact that the combination of your hardware, the installed operating system version (macOS) and the version of Windows you want to run (especially if it’s an older version) might not be supported. The current version of Boot Camp (6.1) shipping with macOS Sierra (10.12) does not support installation of versions of Windows earlier than 8.1, so the newest Macs are not officially supported to install Windows 7 at all. The cutoff date for Windows 7 support for most Macs is 2014 — most Macs from that date or earlier can use older versions of Apple’s Boot Camp software (version 4 or 5) to install Windows 7, but more recent Macs will officially support Windows 8.1 or 10 only via Boot Camp 6. Don’t panic, though. If the combination of hardware and operating system you want is not officially supported, there is almost always a fairly simple workaround. For instance, while Boot Camp 6.1, which installs Windows 10, is not supported for my Mac Pro 5,1 (2012) test platform, Windows 10 can still be installed and works without a hitch — just without official support from Apple. 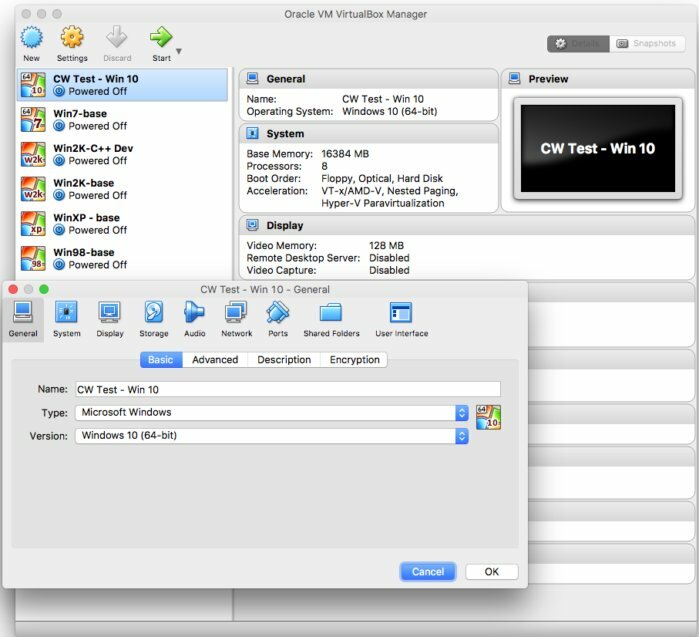 Clearly, one of the advantages of deploying virtualized Windows on Macs as opposed to using Boot Camp is that you don’t have to deal with any of these issues — your virtualization program should handle all of these complexities for you, allowing deployment of any version of Windows you need on whatever Mac hardware you have. Furthermore, a number of the virtualization solutions either include or can be integrated with tools to help with the creation, migration and deployment of standardized VMs, greatly simplifying large-scale implementation and support. That said, using Boot Camp to run Windows on Macs provides unmatched bare-metal performance and has the additional advantage of being free (not including the cost of the Windows licenses). So for both speed and cost, Boot Camp is the baseline. CodeWeavers released the first version of CrossOver Mac in early 2007, providing a Windows compatibility layer based on the Wine open-source project. Basically, CrossOver Mac is a commercial version of Wine with a variety of enhancements and end-user support. CrossOver Mac (and Wine) runs individual Windows programs directly in macOS, inside a container called a “bottle,” acting as a kind of translator between the Windows API calls and macOS. In short, you can run (some) Windows apps with CrossOver Mac without having to have a copy of Windows installed. This is an entirely different approach from Boot Camp, which assists in running a full copy of Windows directly on Mac hardware, and from the three other virtualization products in this review, which run an entire “guest operating system” (in this case Windows) within a VM. The catch (and you knew there had to be one) is that CrossOver Mac does not support all Windows programs, and those it does support are not always supported perfectly. CodeWeavers shoots for supporting as many of the most popular Windows programs as possible, and it currently supports nearly 15,000. It maintains an online inventory of programs that have been tested and either do or do not work (or work with bugs or workarounds), with a five-star system for ranking compatibility. But of course there are a lot more than 15,000 Windows programs. For those programs that do work, however, performance can be very reasonable, especially on faster machines. This means that if you have a relatively small and defined set of Windows programs that you need to run on Macs, CrossOver Mac might be a good fit, but researching the compatibility database and doing thorough hands-on testing prior to implementation are essential. CodeWeavers conveniently provides a 14-day free trial to allow time for testing before deciding whether to commit to a purchase. 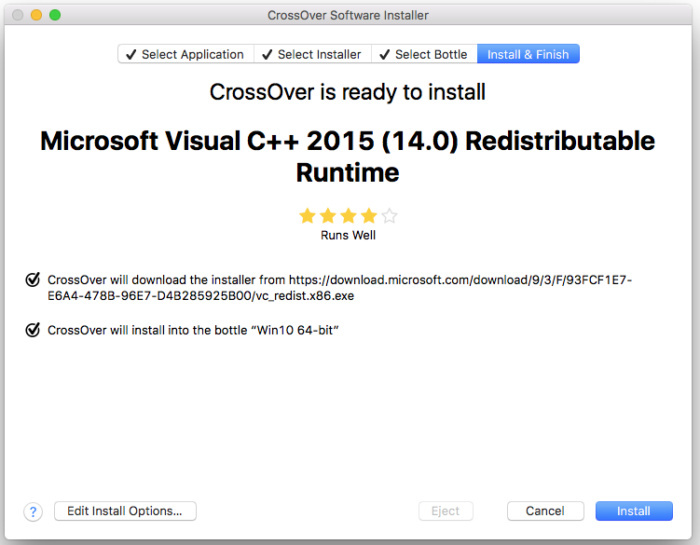 Installation of a single Windows app into a CrossOver Mac bottle is fairly simple and straightforward using the included installer, though perhaps it’s not something a typical business user would casually attempt. Once running, the Windows app appears on the Mac desktop without the surrounding interface (or overhead) of the full Windows operating system. CrossOver Mac Version 16 supports Windows apps going back to Windows 98, and all the way up to 64-bit Windows 10. Pricing for CrossOver Mac depends on several options: a one-time purchase of the current version is $39.95 per copy. For $59.95 you get the current version, one year of free upgrades, and a single support call (phone support can also be purchased as needed for $19.95). A one-year plan can be renewed at a 50% discount. Finally, there is a lifetime license option (perpetual upgrades, unlimited email and phone support) for $499.95 per seat. The standard one-year subscription is periodically substantially discounted, so watching for discounts (or negotiating for volume licensing) can provide cost savings. The next version, CrossOver Mac 17, is due to be released this autumn and will be built on Wine 2.8, will be compatible with macOS 10.13 (High Sierra) and will support Microsoft Office 2016 (which the current version does not). VirtualBox is the odd duck in this list, in a way. Having been acquired by Sun Microsystems in 2008 (which then became part of Oracle in 2010), it’s a commercially supported, open-source project (somewhat like CrossOver Mac), but it’s a well-respected, major virtualization product (like VMware). And it has some of the pros and cons of each. VirtualBox can do almost anything the commercial products can do, and the price (for the core package) is right. It has an extensive list of supported operating systems and enthusiastic online forums. Developers tend to love VirtualBox, partly because the core product is free and open source, so it’s a good choice for a pilot project, or if you have a bunch of in-house developers who can adopt the project and make it part of their area of expertise. But compared to the offerings from VMware and Parallels, VirtualBox is less polished and less easy to use. It’s a little clunky, lags a bit in speed and is lacking in some features. From an enterprise perspective, unless you can devote significant resources to it, you may be better off with one of the other options. 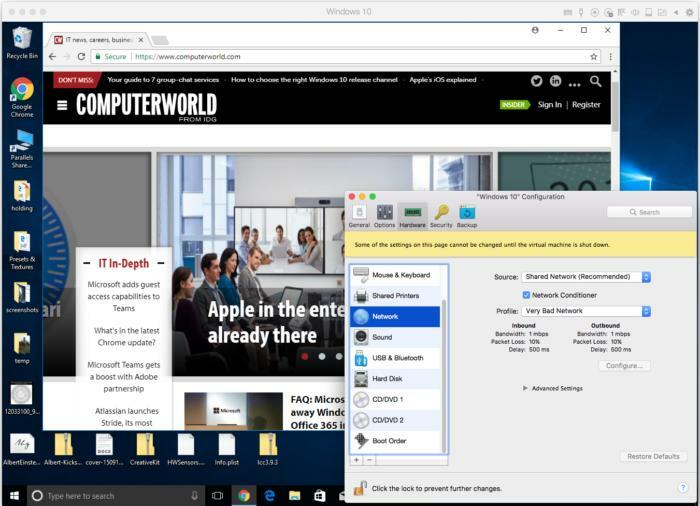 Parallels may be the most intuitive and easy-to-use Windows-to-Mac virtualization product. It feels the most Mac-like. Parallels has clearly given a great deal of attention to UI/UX issues since first launching in 2006. Installation of a new VM is easy and quick. Parallels does not support as wide a range of OS versions as VMware Fusion, but it does support Windows 7, 8.1 and 10 (and older versions via ISO files), as well as one-click installs of five Linux distros, Android x86 and various versions of macOS. A nice touch aimed at cross-platform developers is support for Modern.IE test environments. Other developer-focused features include a network simulation module that can model degraded or minimal network connectivity scenarios within a VM. A Windows VM can be built from an ISO file (pre-existing or downloaded as needed), imported from a connected PC or external drive, or converted from an existing Boot Camp instance. I tried to get the Boot Camp import/conversion to work, but Parallels 13 didn’t recognize my Boot Camp partition, perhaps because I had installed mine on a PCI-based SSD. This seems to be a known uncommon issue and will hopefully be fixed in an upcoming patch. Despite this reminder that Parallels 13 is a very newly released product, it seemed generally reliable and stable during testing. The support forums are active, which is always good to see. One nice feature of the VM Installation Assistant carried over from version 12 is the ability to quickly install and purchase Windows (7, 8.1 or 10) directly, while also allowing installation of un-activated copies. This allows a developer, for example, to quickly create clean development sandboxes that can be used without having to deal with license activation and that can be activated later if needed without having to rebuild the VM. Coherence Mode, a feature Parallels added to Parallels Desktop 2.5 back in 2007, has evolved, much like VMware’s Unity Mode or the VirtualBox Seamless Mode, to allow Windows and Mac apps to run side by side seamlessly without displaying the Windows interface. This is certainly of use for Mac users who are not familiar with Windows. Parallels does a nice job of making the application menus looks and feel more Mac-like, and it includes an option that allows the user to switch back out of Coherence mode easily and quickly. In keeping with Parallels’ focus on usability, there’s a long list of convenience features baked into Desktop 13, including cross-platform TouchID and Touch Bar support for the new MacBook Pros (allowing the creation of custom Touch Bars for Windows apps), 30-plus useful one-click productivity tools for both Windows and Mac bundled as “Parallel Tools,” Mac integration of the Windows People Bar (from the Windows 10 Fall Creators Update), and the ability to access Windows 10’s Cortana from your Mac even if the Parallels VM is not visible. These kinds of things are not by any means must-haves, but taken collectively, they illustrate the care for detail and relative polish of the environment. What is potentially a bigger deal, however, are the enterprise Mac management and integration tools Parallels has created, including the current version of its extension for Microsoft’s SCCM systems management tool, which significantly expands SCCM’s Mac management capabilities. Plain-vanilla SCCM handles Macs in a somewhat limited form, but Parallels has a plugin that extends those management capabilities in dozens of significant ways, from automated discovery and enrollment to patch management, remote login for technical support, remote wipes and more. The new Single Application Mode in Desktop for Mac Business Edition allows deployment of Windows apps that hide both Parallels Desktop and the Windows Desktop entirely — kind of like a super-Coherence Mode — enabling deployment of “stealth apps” to end users on Macs without them necessarily aware of Windows at all. There is also a new mass deployment package for large-scale provisioning. Taken as a whole, the management features Parallels offers add significant value to its product line. The basic Parallels 13 Desktop product (listed as “for home and student use”) retails for $79.99. The Pro product is $99/user/year, on a subscription model (including free upgrades), and adds a number of useful features for developers, plus the ability to scale past 8GB vRAM up to 128GB, and to go from 4 to 32 vCPUs. Parallels 13 Desktop Business Edition is currently the same price as the Pro package and includes everything it does, plus some business-oriented features for administration and management, such as mass deployment options and volume license keys. VMware’s Fusion is another product with a long history in the Mac virtualization space, but for VMware, Macs are one small part of a much larger enterprise picture. VMware was the first company to successfully create products offering x86 virtualization, and literally (and virtually) sets the standards in many cases for hypervisor architectures and virtualization technology. Fusion first appeared on the market 10 years ago, and since then, Fusion and Parallels have tended to leapfrog each other with new releases. At the time of publication, VMware has announced, but not yet released, its new version, 10. For this review, we looked at the current version, 8 (VMware is skipping version 9), but we’ll soon have a follow-up review of Fusion 10, which looks to have a number of very solid enhancements for the enterprise market. The list of available supported VMs for Fusion goes far beyond Windows and includes 95 different OS options (the full list can be found here). For running Windows on Mac, your options under VMware Fusion go all the way back to Windows 3.1 and right up to Windows Server 2016 and Windows 10. VMware Fusion has full compatibility with VMs created with the other VMware products as well; there can be significant systems management benefits to using Fusion in conjunction with other VMware products already in use. In the lab, the “easy install” option for Windows 10 worked without a hitch — quick and simple, installing from a Windows 10 x64 ISO file saved locally on my Mac (though a DVD or USB-drive ISO work just as well). Cloning my existing Boot Camp partition into a new VM also seemed to work, and did in fact boot up easily, but there was a persistent driver-incompatibility error preventing network connectivity that I did not have time to resolve. It’s an area I’ll investigate further, but in general, you’re probably better off starting with a clean install of Windows and/or developing standardized Windows VMs to distribute. The Unity option is similar to Parallels’ Coherence view, where a Windows app can be presented inside the macOS desktop as what appears to be a stand-alone application, side by side with macOS app windows. One small but interesting difference is that with Coherence, moving virtualized windows is fairly smooth and seamless, but Unity windows were sometimes visually jerky and at times briefly showed fragments of the Windows desktop around the edges as it moved. Functionally, both are totally usable, but it is one of the areas where Parallels seems to have a bit of an edge on polish. The current shipping price for Fusion 8.5 (including free upgrade to Fusion 10) is $79.99 per Standard and $159.99 per Pro license, the latter of which includes 18 months of email support. Volume purchases (10-plus licenses) have other support options (business hours and 24/7) available for additional purchase.